Here’s a book I wrote! You can WIN a copy! It’s easy! The details will be in Tuesday’s “Snacks” – that’s our weekly email of fun and doable business-y stuff. Don’t get it? Just scroll down to the Pop Up thingo below, sign up (it’s FREE) and it’ll pop into your email box on Tuesday. What to know what our Snacks look like? Here’s last week’s! Want to know more about the book? Here’s what people have been saying about it! Want to know what you’re going to have to do to WIN it? Not much! Were just going to ask you to tell us a little bit about your business and why you’d like a copy of the book. SIMPS! 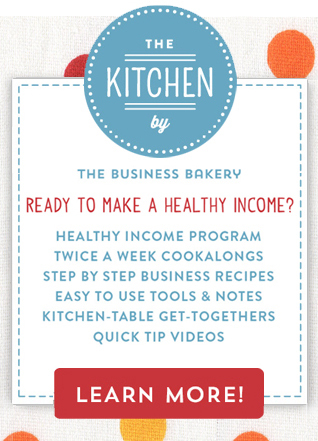 25 Comments on "WIN a copy of How to Bake a Business!" I run a small home business making and designing children’s clothing for 0-12years. Everyday is a struggle to keep my business alive! I have little time to market my business as much as I would like! As I have 2 ankle biters age 2 and 1! The reason I would like to win this book is for help and advice on how to market my brand more efficiently with the limited time I have! Also any motivational ideas are always a big welcome!!! Hello,I live in a very small village in a swiss valley. I run a little cake business to support me and my son. I think I’m quite a good cake decorator, but I’m a very bad business woman ( and my location does not help ). I have subscribe the ” cookalong “( that surely will help me) but I would very like win this book to improuve and complete that part of my business . Thanks Julia for all the tips you are giving us. I run a small handmade bath and body business. Things are moving along tickety-boo, but I’m ready to take it to the next level this fall when my two little ones will finally both be in school! There’s always more to learn when it comes to business – I’d love to check out this book! Hi there, my husband and I have a sweet little (growing…) business which we love and really want to grow! We started 3 years ago and have had to diversify as we have grown realising that some areas of our business were not working for us and have had to take some ‘punches’ along the way. We would love to win your book! I own a small business making custom home and event decor. My business was started for my love of making things and I’m learning about the business side as I go along. I would love to win a copy of the book to help me continue learning the business side of being a small business owner. I could use the help! I run a household, study and run a small business from home and I sell on eBay. I know that I am losing money selling this way, but am not certain about other avenues of exposure. I am hoping to grow my business, and would love some checks and balances along the way and some informative inspiration and confidence to guide me. I love baking and decorating cakes for family and friends. I was very busy in NY, but then we moved to Fl. I am not too sure how to start off my business here with unfamiliar people. Any and all advice you could share would be phenomenal! Thank you in advance. Hope i am a lucky winner. Hello, my name is Gemma and I live in Cornwall, England. I am currently setting up my own small baking business called ‘Gems if Baking’. I have a real passion for baking and am working hard to find a unique selling point and ensure I know everything before I step into the big world of baking. This book you have written would really help me and I think it’s great there is something out there like your book for people just like me. Thank you for running this competition. Gems of Baking. I have started a small bakery business at home and have my own recipes and such, yet I have been doing this for two years now and still moving slow. Baking and cake decorating is my passion and what I want to do for the rest of my life yeti know that I could really use some good advice and help for I what to be successful and grow that’s why I think this book could really help me. Thank You! I started my little cupcake business 3 years ago, and I am so proud of what it has grown into. I know that it can be better and I am taking steps to learn how to manage the business side of things a lot more instead of just floating along blindly. 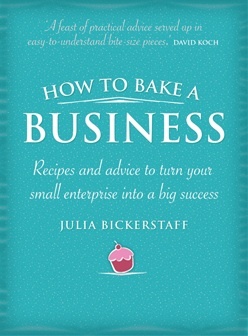 Julia Bickerstaff offers the best advice and I would love a copy of her book! It would be my little, take anywhere, business bible! Its time……..time for mummy to realise that she has a dream of running a successful small business, doing something that she loves and that it is ALL possible……you can be a great Mum and a great business owner! Any help and information is a BONUS! I make one of a kind handmade paper crafts such as scrapbooks and cards for people who do not want to create themselves… I also teach people how to make their own style of handmade scrapbooks, cards and paper crafts. Anything that can help me take my business to the next level – get it done… instead of just wanting it… I am hoping this book would be “it” for me! Hi! I’m a freelance illustrator and maker, based in the beautifully historic countryside of Nottinghamshire, UK. I set up my business around 1-2 years ago with the aid of the Princes Trust and have steadily been growing and growing my illustration led business. I sell a variety of giftware, including greetings cards, jewellery, purses, iPad cases and temporary tattoos, but am looking to expand my work purely into textile based items using my illustrated surface designs. Winning your scrumptious book would certainly help direct me in what is a bit of a ‘fork in the road’ period for my business. I have a home-based bath & body business using all natural ingredients. My products are hand-made from scratch & made with love and care. I’ve been in business 2.5 years, celebrating 3 years in November. This is my 1st business & have quit my full-time job to run my own business full-time. I’m still learning & looking for creative, affordable marketing strategies to take it to the next level. I would love to have this wonderful book as the tool to help me get there. Thanks for the contest! I have always wondered – Can I do this? Can I make money from my dream? can I actually support myself, working from home, doing my passion? The truth is – I’m still not convinced on this. But I’m not going to die wondering any more, I’m going to give it ago. Even if it starts by supporting my hobby. I hand make / sew gifts, bags, cluches, travel wallets, and organisers, backpacks for kids. – pretty much anything that involves a sewing machine except clothes. Oneday I would like to add a “resellable ” digital product to my line aswell. I would love some guidence, anything that can help me boost my business from hobby > dream. – a few different ways to take it to the next level. I read your “snacks guide” as it comes into my email every week, and i love it. My name is Chandelle and I am based in Townsville, I own a small at home wedding and event decorating business. I have been operating for the last 3 years with success but I would love to be able to increase my clientele and promoting my business successfully but I don’t know how to do it. I have two children and I also work part time, try and run the business and have a husband who works away so I would love to be able to make the business successful enough to be able to support my family and make it my main source of income. My professional organising business is coming up to its 2nd birthday this year. I help my clients declutter & organise their homes & offices and am always looking out for down to earth business advice which is easy for a solopreneur to put into practice. This is precisely why I would love, love, love to win your book! My daughter (10 years old) is a great supporter of mine and is already planning her own business! I would love to arm myself with more knowledge & tools to inspire the next generation of entrepreneurs. I started my own baking business a couple of years ago… registered the business name, bought some supplies, and had the use of a commercial kitchen. When the agreement for the kitchen fell through, my business stopped running. I now just bake and make decorated and 3D cakes for my family and friends, until I can get back into a proper kitchen, and really want to get my business back up and running. I’m a photographer and a stay at home mom. I have had my photography business for 6 years yet barely make any money. I would love to turn it into a family business, one that we could potentially live off of! I would like a copy of this book because I’m sure it has some really good and useful information for me (and my family). I have a home-based custom cake, cookie, cupcakes, cakepop business. Trying to grow to eventually open up a shop. Doing all I can to get my name out there. Always trying to learn & develop my skills more & more as I go. I have been a pastry chef & in the industry for about 14 yrs. I finally got the opportunity to try this because the restaurant I worked for closed down. I saw it as a blessing in disguise. So far I have been able to work on my own craft a lot more and really expand my portfolio much more than when I was working full time! My business, History from the Heart, was founded in 2006 and was one of the first personal history businesses in Australia. I help people to gather, organise and preserve their own/family life stories to leave as a legacy for future generations. I do this either by commission, turning the stories into a beautiful book/s or by teaching people how to write their own personal history via classes or workshops. I also founded Life Stories Australia, Inc, a not for profit and registered charity where seniors come together in a Life Story Circle to tell their own life stories and to listen to the stories of the other Circle members. Trained volunteers record and upload the stories for the family and as part of our living history. I am a children’s boutique clothing designer & sewist! I started my business 3 years ago on Etsy and recently starting a facebook page. I work full-time but would LOVE to be able to quit my outside job and make this my full time business. Currently trying to balance growth with time available- would love to win this book as I think it might be just the info I need to “bake” my part-time business to a full-time bakery!!! !